I rarely get injured during rescues. A few bites and scratches are inevitable but not much more. One time a big male swan managed to put his clawed foot in my face. Luckily the claws missed my eye. The injury looked really impressive because there was blood everywhere, but the scratches were minor. I think I’ve avoided injury because I’m careful. That, together with a bit of luck, goes a long way, especially during the first moments of contact with a struggling creature. However, today is an exception because I’m nursing a very sore ear, sustained during a rescue – not from a bird, but as a timely reminder that when you ‘rush’ you’re more likely to get injured, no matter what you’re doing. It all happened after receiving a call late yesterday from a homeowner who lived adjacent to a canal. She’d spotted a swan with a tiny fish hook protruding from the corner of its beak. A week earlier she’d watched a fisherman hook that bird. He’d cut the swan free without rendering any assistance or calling for help. Despite a thorough search we’d been unable to locate it. Now it was back at her dock, along with several other swans, all hoping for a free meal. I was 30k’s (17miles) away attempting to catch an ibis entangled in fishing line. It was bad timing. There’s nothing worse than getting one emergency rescue call on top of another, knowing that you’ll have to prioritise one injured bird and leave the other to suffer for longer. In this case the swan was my priority because the position of the hook in its jaw made it a life threatening injury. Some hookings are superficial and easily treated. Others can be very serious and will kill or maim a bird unless removed quickly. 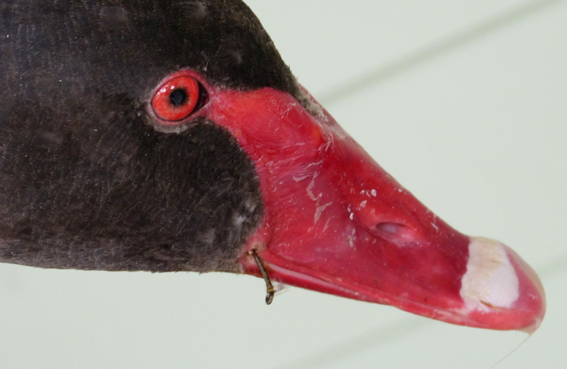 In this case the fish hook was tiny, but it was lodged deep in the jaw at the corner of the swan’s mouth. Swelling was already evident meaning that infection had set in. A few more days and this bird would have difficulty eating. Any longer and infection could enter the bone and kill the swan. I left the ibis and rushed to my car, at the same time instructing the homeowner by phone to keep the swans around with food, but not to overfeed them or they might swim off before I could get there. The rescue location was forty minutes away through traffic. Would the bird stay for a whole forty minutes, or would it eat its fill and leave? It was anyone’s guess. I checked my roadmap map at every red light. The route to the rescue site was complicated. I tried to commit it to memory. It was agony knowing the injured swan was almost within my grasp but aware that it could swim off or take to the air and disappear at any moment. During the drive I made several calls to the homeowner. She confirmed the swans were still there and feeding happily. So far, so good. I made good time and thirty minutes later pulled up outside the correct house number. Leaping out of the car I scrambled to grab my long handled net. There wasn’t a moment to lose. At the same time an Asian gentleman appeared in the driveway. I figured it was the caller’s husband and he’d come to meet me. I said the caller’s name and he nodded. I gestured towards a path that I’d been told to go down by the side of the house. He smiled and nodded again. I took off, flat out, down that path. He followed. Bounding down the steps at the rear of the home I soon arrived at the water’s edge. Breathless, I scanned the area. Something was wrong. There wasn’t a swan in sight. Nor was there anyone on the pontoon. What the …?? I looked back at the Asian guy and asked, ‘where is your wife … and where are the swans?’ He replied, ‘English no good’. That’s when I knew … I was at the wrong bloody house! The street number was correct, but not the street. I rushed back up the path towards him, stopping momentarily to try and explain what was going on. If he didn’t already think I was a fruitcake it was soon confirmed as I stood there flapping my ‘wings’ wildly and pointing at the water while pushing a crooked finger into the corner of my mouth, all in a vain attempt to simulate a hooked swan. His look of bemused indulgence said it all. There was no point in continuing. I rushed on up the path yelling … ‘sorry … sorry … wrong house’ … and bolted from the property. That’s when it happened. The outer gate post had a long, protruding metal hinge. As I ran past it caught my right ear. The blow stunned me. I grabbed my ear, relieved to find that it wasn’t badly torn or bleeding profusely. The injury could have been much worse. But there was no time to waste. I’d already lost a precious five minutes, all because I was ‘rushing’. I loaded the net into the car and drove half a kilometre to the correct address where I was shepherded directly to the water – this time down the right path. To my great relief the swans were still feeding. I quickly sized up the situation and moved into position on the dock, close to the birds. This time I didn’t rush. My right ear gave a stinging reminder that rushing can lead to big problems. I also know the importance of waiting for just the right moment to strike. Patience is vital for a successful capture. If I missed and spooked the bird it would be gone. Losing it for another week could prove fatal. Missing was not an option. The swan was a big, feisty male. He’d pushed his way to the front of the pack. This was an advantage. Weaker subordinate birds get bullied to the rear, making them harder to catch. If I timed it right I wouldn’t even need the net. I coaxed him in and waited until he ducked his head underwater for food. In that moment his sight would be blurred. I dived forward, grabbing him by the scruff of the neck and dragged him kicking and flapping out of the water. It was over within seconds. We had our bird. He’d get the treatment needed to save his life. Once the swan was secure I set about explaining why blood was dripping from my ear onto my shoulder. The homeowners were very kind and offered to help. As luck would have it she was a nurse and her husband a neurosurgeon. Clearly I was in the right place this time! They patched me up and gave me some pain killers. Soon I felt much better. It was a lucky outcome, not only for the bird but also for me. Early next morning I took the swan to hospital. The hook was removed and antibiotics administered to kill the infection. A week of convalescence was anticipated before ‘Fred’ could be released back to his flock. Fortunately my injuries were only superficial however the experience taught me that the riskiest part of a rescue doesn’t always involve the creature. Often it’s the stupid stuff I do in my ‘rush’ to help them. Slow and steady wins the race.